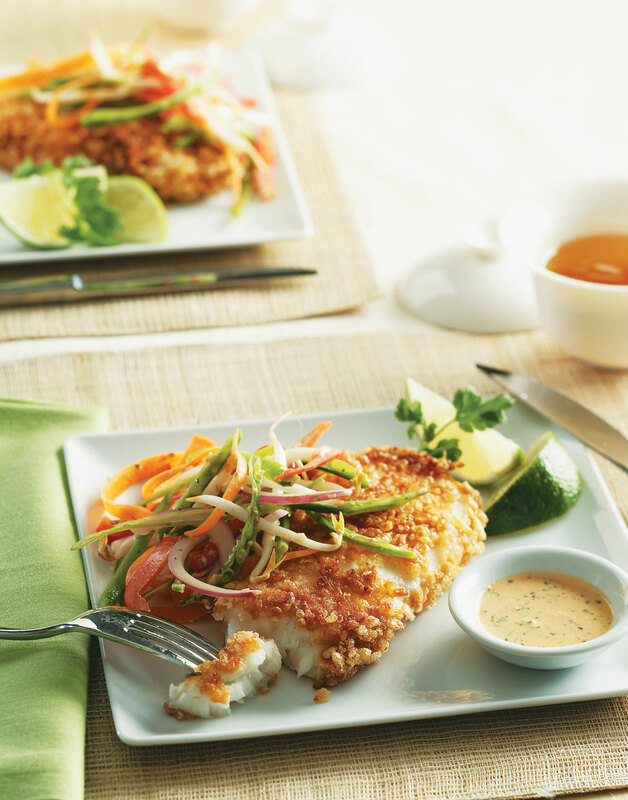 For a fresh take on deep-fried fish, coat fillets with crispy rice cereal, and pan fry. You’ll have a gorgeous crust for way fewer calories. Sea bass is snow white in color and has a buttery, mild flavor. Grouper or cod make great substitutions. Place egg white and soy sauce in a bowl; beat at high speed with an electric mixer until soft peaks form. Season fish with salt and pepper. Dredge fillets in flour, shaking off excess. Coat fish in egg mixture, then dip fillets in cereal. Heat oil in an ovenproof nonstick skillet over medium heat. When oil is hot but not smoking, add fish and cook until golden, 2–3 minutes per side. Transfer pan to oven and roast until the thickest part of fillets flakes easily with a fork, 8–10 minutes. Garnish fillets with lime wedges and cilantro sprigs. Serve fillets with Lemon Grass Slaw, using extra dressing from slaw as a dipping sauce for fish. To create an even coating, crush cereal in your palm before dredging egg-dipped fillets. Sauté the fillets on both sides just until the crust is golden. Finish cooking the fish in the oven.